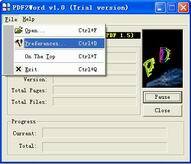 Our Acrobat-to-Word Converter is the perfect and reliable way to convert from PDF file format to Word for easy editing. This Acrobat to Word documents converting software easily turns the text, images, drawing primitives from any PDF file into MS Word format with a minimum loss of converted information. You will be amazed with the results you get from our PDF to Word doc converter: all tables, images, text, columns and layout are accurately retained as in the original PDF file. Acrobat to Word Document Converter instantly converts PDF files into Microsoft Word documents that look just like the original - complete with all formatting and images! Information is set free - free to be edited and free to be integrated into your documents. Acrobat to Word Document software is a standalone program and does not require Microsoft Word, Adobe Acrobat, or even Acrobat Reader. Acrobat to Word Document is a batch PDF Converter that you can convert a lot of PDF files to word documents once time! saving your time! Acrobat to Word Document is a standalone software, MS Word, Adobe Acrobat and Reader NOT required! In case of multi-column text layout in the PDF document, during conversion Acrobat to Word preserves the original multi-column text and page layout. You can edit the text with ease in your converted Word document. VeryPDF Acrobat to Word Converter handles True Type Fonts successfully leaving little scope of not replicating text as in PDF files. The software handles symbolic fonts in an enhanced manner.